This article was first published in Hype & Stuff on 25 October 2017. The Japan we envision or feel in each of our hearts is different. 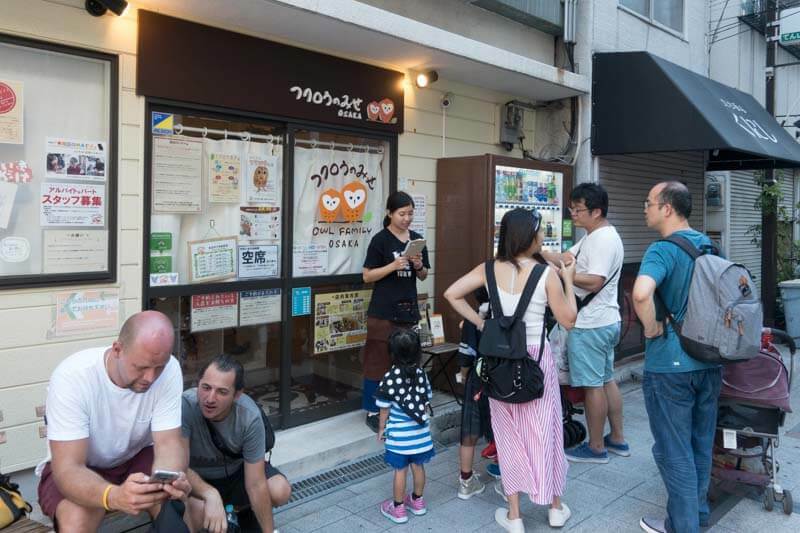 But we can all agree that beyond her rich and dynamic culture, her myriad of mouth-watering delicacies, and her well-respected civic-mindedness, life in Japan is fascinating. Essentially, there are many things that one can indulge in while visiting the Land of the Rising Sun. To have an itinerary that is brimming with activities and places to visit is perfectly common though – one can never be too ambitious, right? 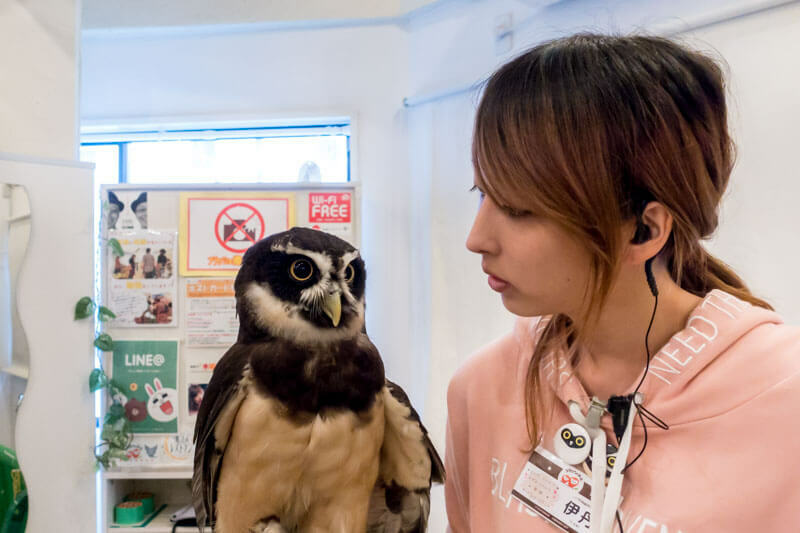 The prevalence of endearing animal-themed cafes in Japan — cats, dogs, hedgehogs to list a few — started as a mean to fill an emotional void for those who do not own a pet or for people to relieve emotional and mental stress. Lately, these cafes have seen an increase in visits from tourists, like myself, who are curious and interested in the novelty of it all. 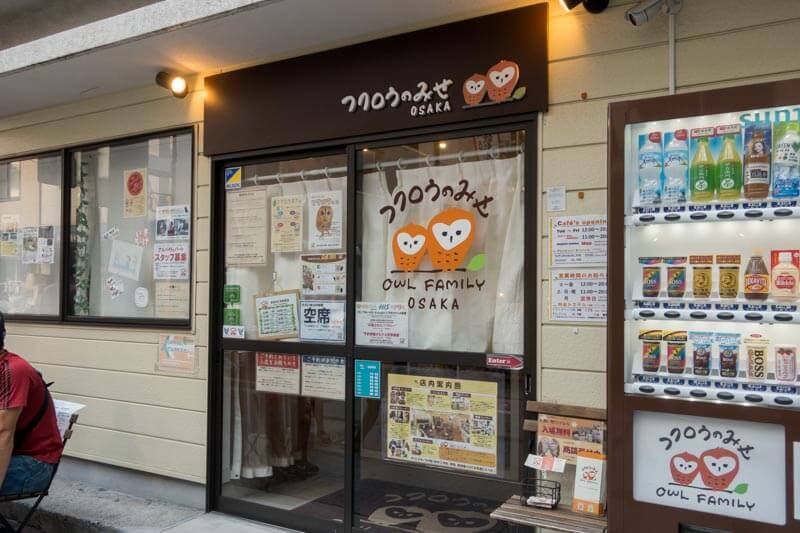 The Owl Family Cafe (Fukuro-no Mise フクロウのみせ) is one of them. 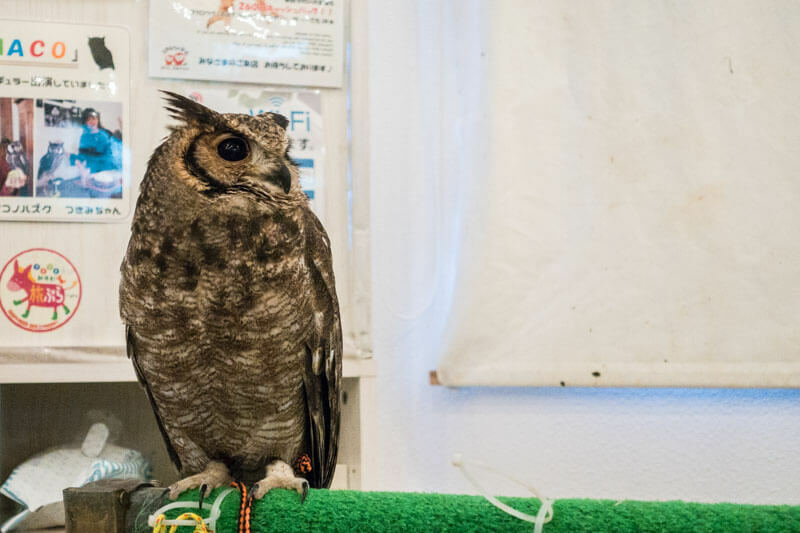 Tucked away in a corner of the ever-busy Tenjinbashi shopping street in Osaka, one can spot the owl cafe from afar through the throng of people milling outside the storefront. Entry to Fukuro-no Mise is priced at ¥1,500 (about S$19) per hourly session. Sadly, you cannot do a walk-in as and when you arrive. Operating on a fixed time-slot system that splits the day into several hour-long sessions, the cafe only allows a certain number of visitors in per session. But that should not deter you from arriving early, as you will still have to beat the queue. If you, like me, arrived early, you could simply leave your name on the waiting list with the amiable staff. 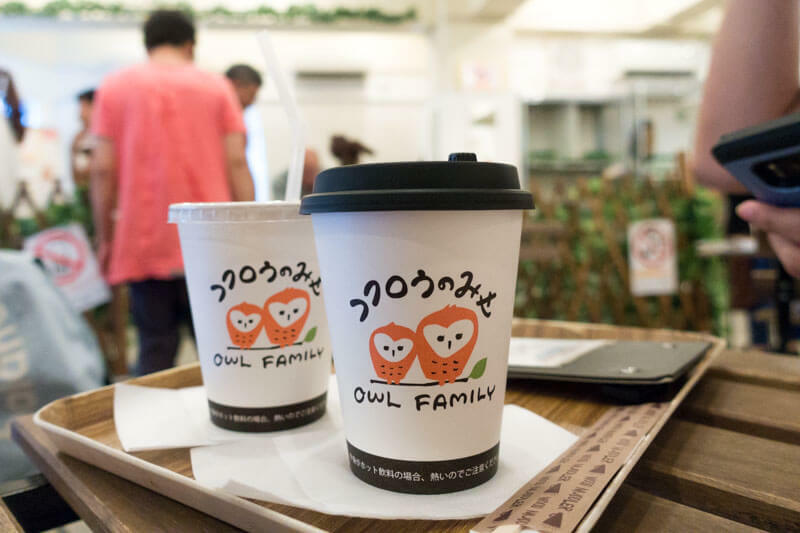 Inside, the cafe is split into two halves: one of which is designated as an interactive zone where you can get up close and personal with the owls, and the other serves as a resting area where you can sip your drink or shop for souvenirs. 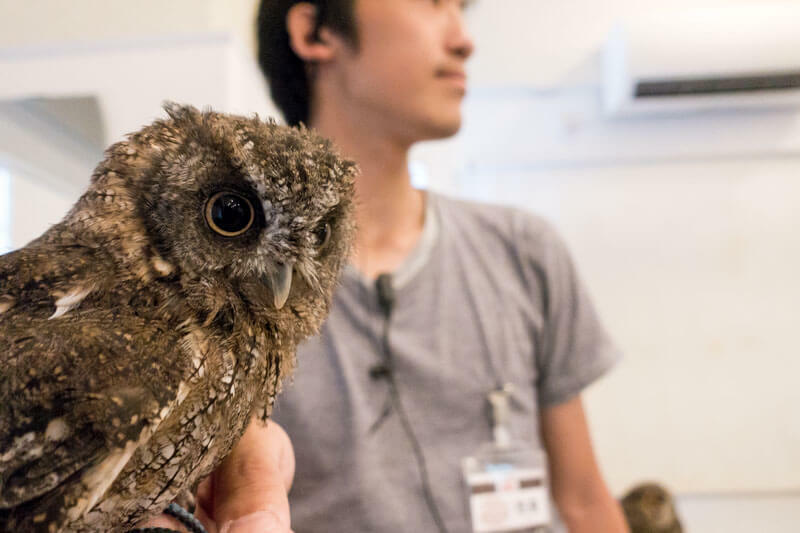 Each entry comes with a complimentary non-alcoholic beverage of your choice, and you can choose to top-up an additional ¥200 if you fancy a beer instead. 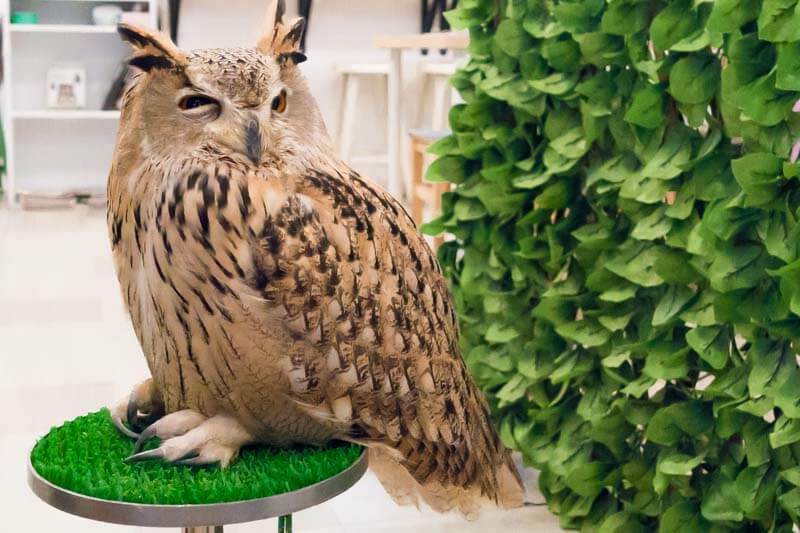 The cafe does not serve food for obvious reasons; You wouldn’t want your feathered friends swooping over your head and nibbling on your food, would you? The staff at the cafe spoke limited but comprehensible English. The session began with one of them giving us a 15-minute briefing on the rules and regulations of the cafe. Should you have trouble understanding them, you’d be glad to know that there are laminated copies of the rules written in English and placed on each table. There are several rules that visitors of the cafe ought to adhere to. 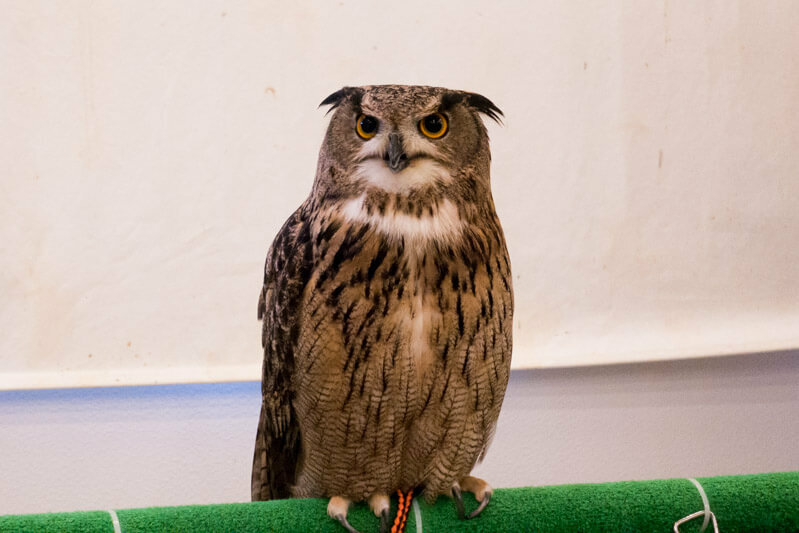 These ensure the welfare of the owls while at the same time abstain visitors from harm. 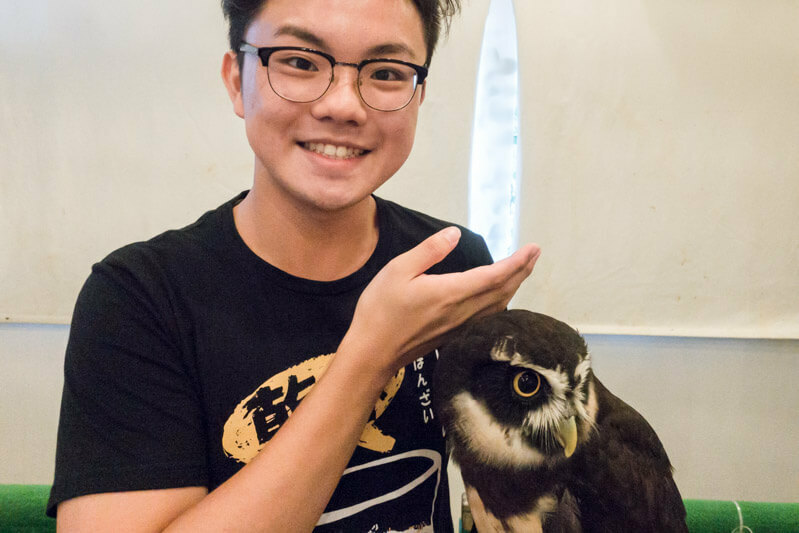 No flash photography is allowed within the premises but you are more than encouraged to take selfies or pictures with the adorable owls. 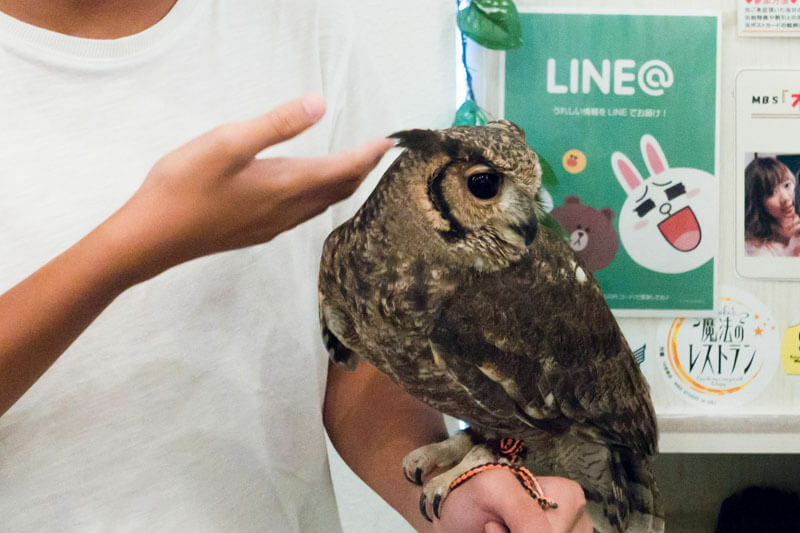 There is also a certain way to pet the owls’ heads or carry them. You will also be forewarned that the owls might crap on you. 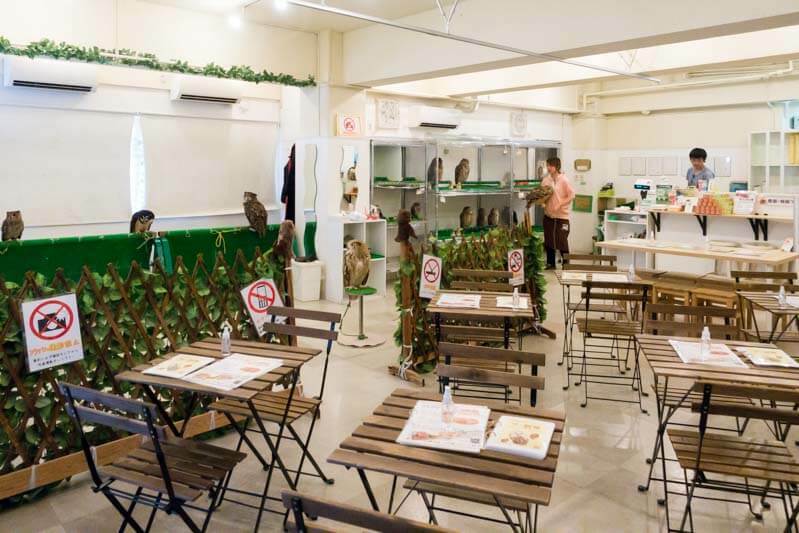 Fukuro-no Mise houses close to 20 different owls, most of them perched on stands and bars within the interactive zone. Some yield extremely endearing appearances which make the heart tingle (and the urge to nuzzle intensify). There were also a couple of owls though who were threatening us with their fierce glares. 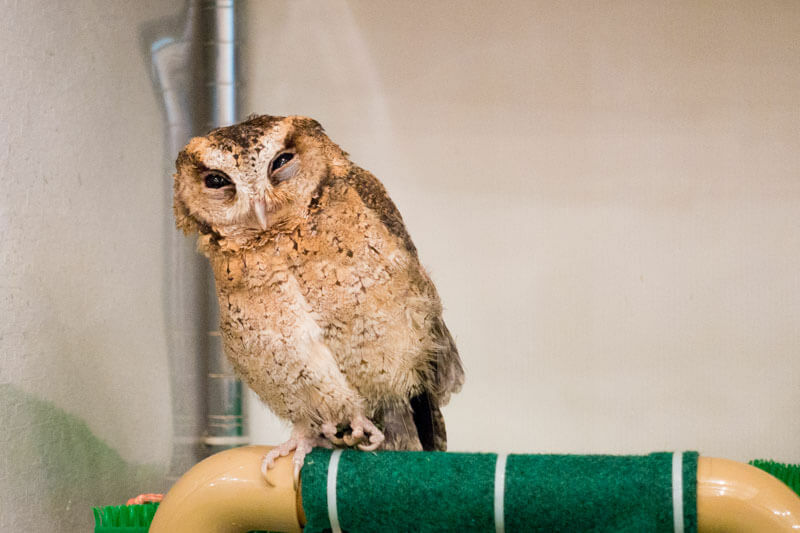 The owls are classified into different size categories: the small-sized owls weigh about one to two kilograms, the medium-sized owls weigh about three to seven kilograms, and the large-sized owls weigh above seven kilograms. 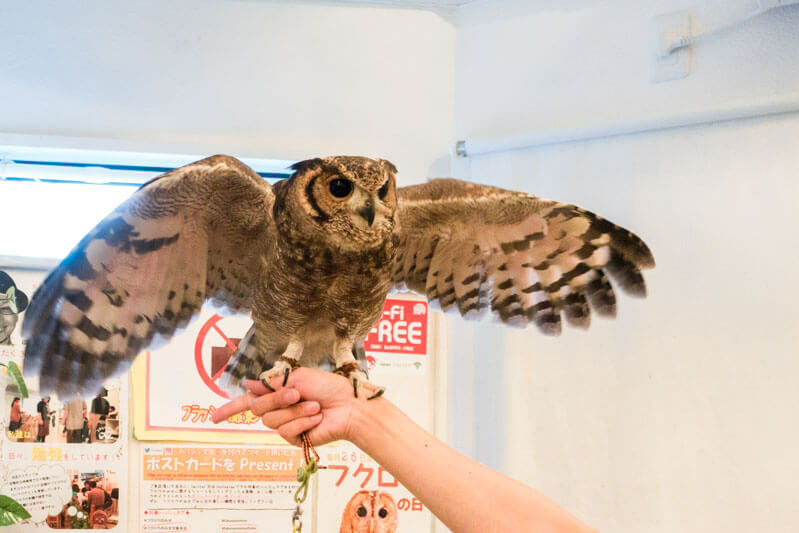 It goes without saying that you will not be able to carry the large-sized owls on your arms or shoulders. 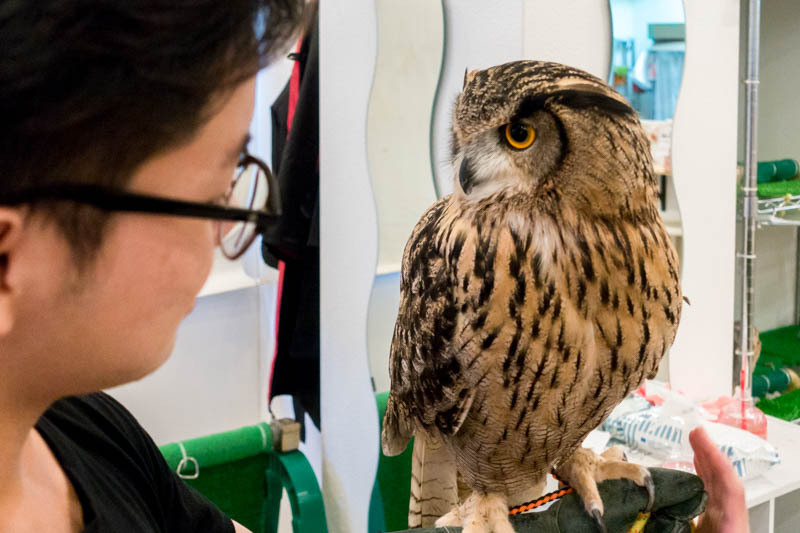 You are encouraged to pat and gently caress the owls on the back of their head but only with the back of your hands. 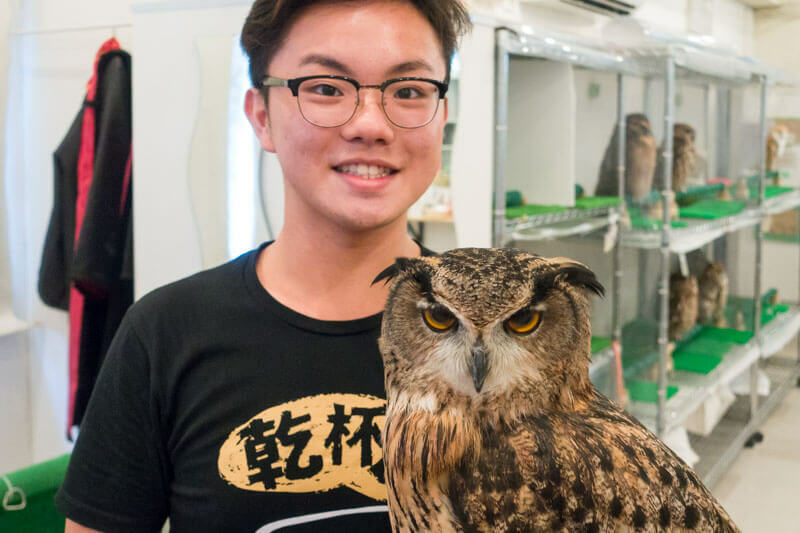 Should you want to have any owls perched on your shoulders or wrist, feel free to seek the staff for assistance. 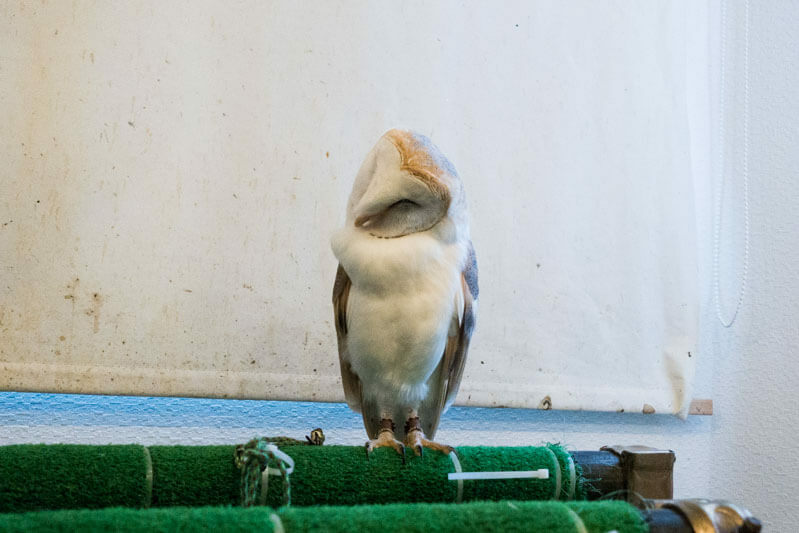 I have always known that owls possess this extremely eerie form of flexibility — their uncanny ability to twist their head almost 360 degrees. 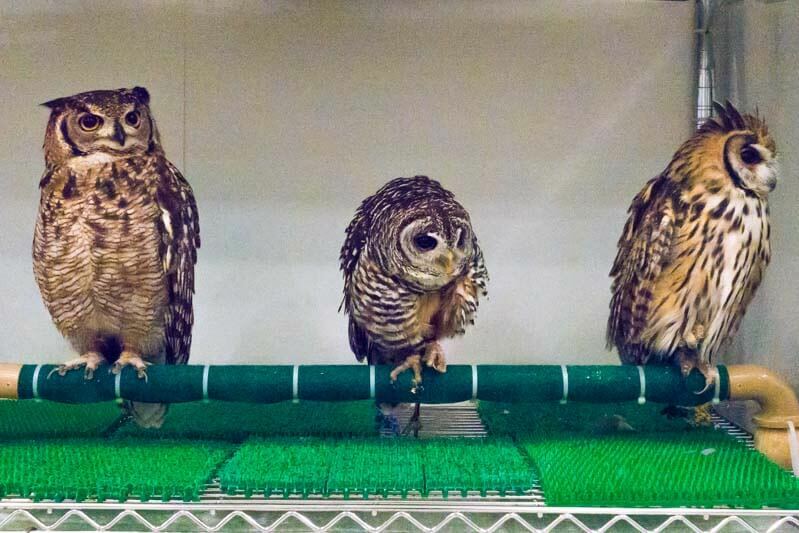 To see it happen with these owls was quite a baffling and intriguing sight. This is another one of the reasons why you may possibly have trouble snapping the perfect selfie. Feeling daring? 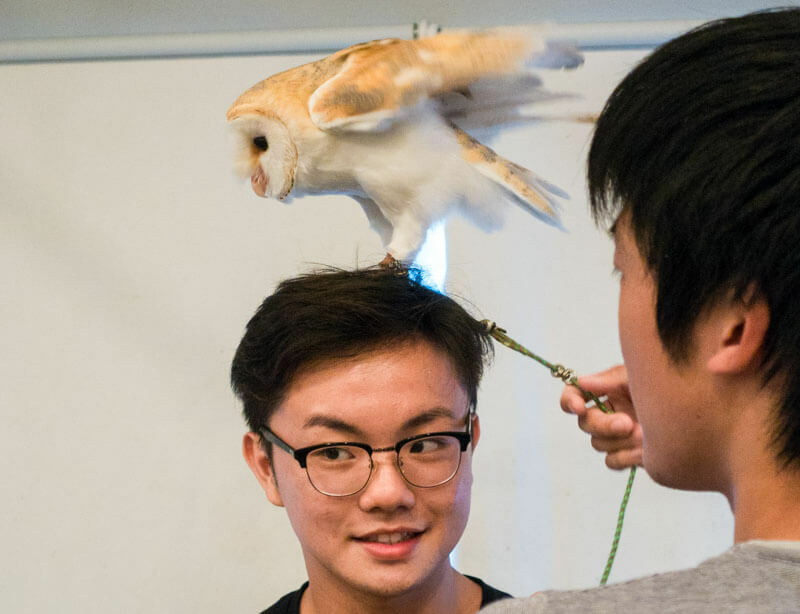 You may also request to have one of the owls perched on your head. If you are feeling even more adventurous, ask for three to be perched on your head, shoulder and hand. You have been warned though, sometimes sh*t happens. My hour-long visit at Fukuro-no Mise was beyond enjoyable. Being close to these mysterious and absolutely adorable creatures made my exhaustion (from the long hike in the summer heat) and woes go away. My only advice? Cherish your time there and make the most of it!